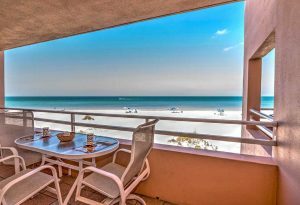 Coquina Beach Club 102 – Condo 2 Bedroom/ 2 Bath ocean view, maximum occupancy of 6 people. Beautiful sugar sand beach, brilliant sunsets and balmy breezes await you at this two bedroom, two bath, beachfront condo. With exceptional views of the Gulf of Mexico, enjoy this spectacular view while sipping on your morning coffee…a beach lover’s paradise. Light, bright and airy, this condo is truly a delight. Coquina Beach Club has a heated pool, covered parking and is within walking distance of several restaurants. Close to shopping,fishing and the free trolley.